When I was asked by my step-daughter if I would make her wedding cake, my first reaction was to be flattered that she thought me capable of providing the kind of creation that I knew would have to be pretty damn near perfect and very, very beautiful. Of course I said yes, but then the panic set in. I’d never made anything as large and important as a wedding cake and my icing skills were practically non-existent. Determined to find a cake design that was achievable and stunning to look at, I set to work. A few internet searches for recipe ideas revealed that there was a mountain of information to wade through and the thousands of wonderful creations on Pinterest nearly made me weep with envy knowing I could never achieve such spectacular results. Discussions about what sort of cake the couple wanted ended up with us deciding on a fruit cake for the bottom tier and a light lemon sponge for the top two tiers. Who better to turn to for a celebration cake recipe than Mary Berry. In her Ultimate Cake Book she lays out all the different cake sizes and the ingredients in an easy to follow table, and as it’s an “all in one” method it was simplicity itself to make. With that done, fed with a slug of brandy and stored away in a cool place for a few months, it was on to testing the lemon sponge recipes. 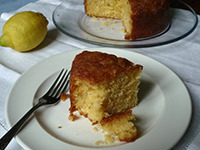 The Crunchy Top Lemon Cake recipe by Mary Berry is a frequent bake in our house. 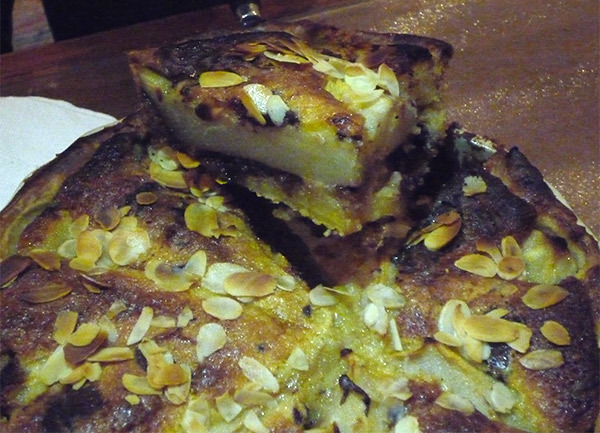 It’s moist and full of sticky lemon sweetness – irresistible ! However, too soft for a wedding cake, it would never support the icing. I found what I was looking for, along with a design idea, on the BBC Good Food website with the Zingy Lemon wedding cake by Jane Hornby. You’ll find three simple wedding cake recipes there, something to suit all tastes. The Simple Elegance Wedding Cake design was just what I was looking for for my step-daughter’s Cornish country wedding. With the lower tiers already prepared and stored away, that just left the lemon sponge to bake a couple of days before. Icing a three tier cake is never simple but when you’re borrowing someone else’s kitchen expect a few nightmare moments. A few essentials to remember – get cake boxes to transport each layer in safety and take a bit of spare icing to smooth out any wrinkles or for last minute repairs should there be any damage. Having made it to the venue, cakes intact, the final touches could be made. The beautiful white hydrangeas and gypsophyla had arrived from the florist and I just needed some quiet time to make the tiers and decorate it. The simplicity of the white icing and flowers matched the occasion perfectly. This time of year, wander the local hedgerows and lanes around here with a carrier bag and you could bring home a bountiful supply of free food. My absolute favourite, for two main reasons, is walnuts. First reason is they are free. Second reason is they taste amazing. With a big bowlful of walnuts on the kitchen counter it’s hard to resist using lots straight away in recipes like Spiced Apple Cake with Walnuts or Walnut Bread ( easy in the breadmaker and great with another seasonal favourite Potimarron and Leek Velouté ). If kept dry and away from the sun, walnuts will last for ages so we fill our pockets every time we go for a walk and make sure we squirrel away a good stash. 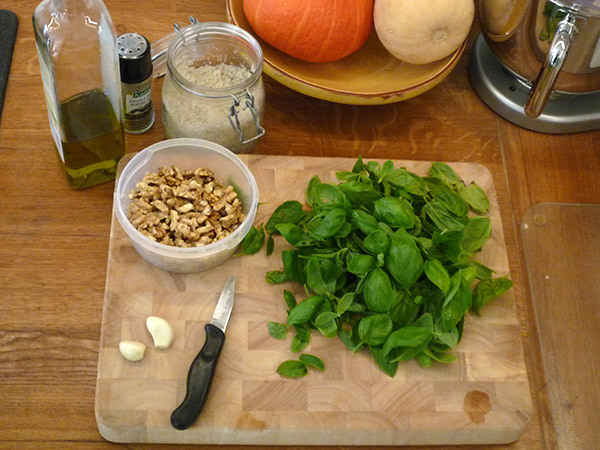 When the walnuts started to fall to the ground this year, my step-daughter happened to be staying with us and suggested we make pesto. One jar of pesto will keep in the fridge for several days and will be OK if you keep the surface covered with olive oil though it might go a bit brown. 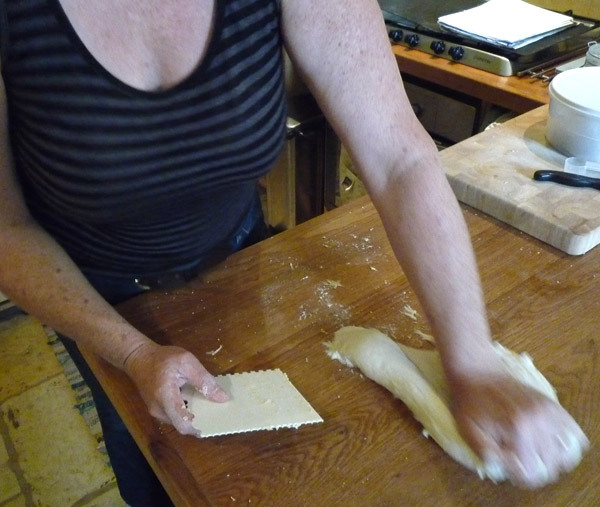 You could also freeze small quantities for adding to pasta for example. Half of our first batch was stirred into tagliatelle, the second half was spread onto fresh whiting and baked (called merlan in France, it’s a reasonably priced fish similar to cod or haddock), served with salted potato wedges and fresh salad. You could also spread it on bruschetta, dollop some in your soup, make a toasted sandwich, stir some into mashed potato, or put it on a pizza. 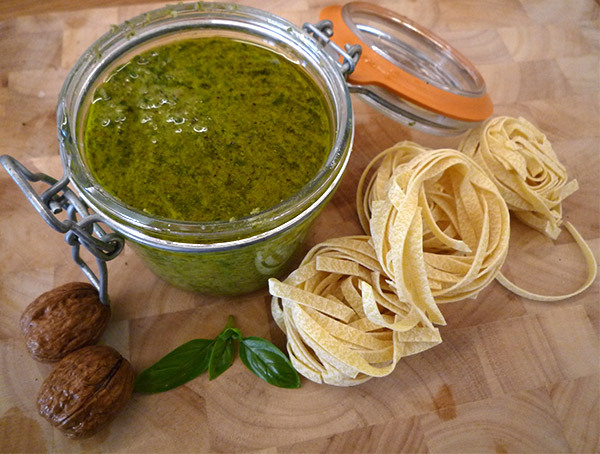 So here it is, the ever so simple but very impressive Walnut Pesto. 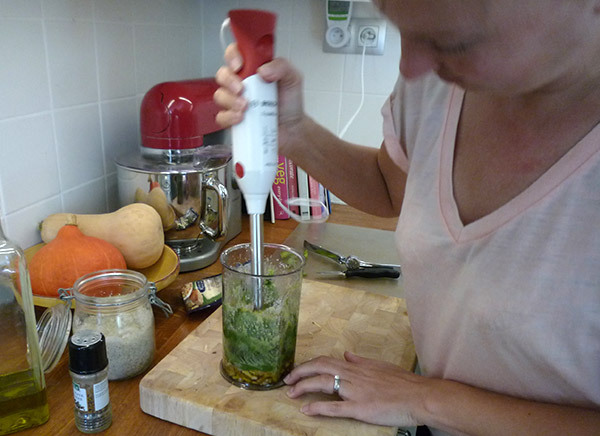 You’ll need a blender or stick-blender to make this, and if you want to store it, a sterilised jar with an air-tight lid. None of the ingredients are measured exactly, which is a good excuse to keep tasting it to get the balance and seasoning to your taste. 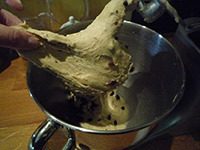 Put all the ingredients in the blender and whizz to a pulp, adding more oil if necessary and seasoning to taste. Use straight away or seal in a jar and refridgerate. Spiced Apple Cake with Walnuts is a delicious moist cake that can be served while still warm or stored for several days in an airtight container – if it lasts that long. It’s also a good way to use up some seasonal produce, and freezes well. I’m posting the recipe in my next post. As the summer harvest of tomatoes threatens to overwhelm you, Stuffed Tomatoes are a great supper idea using storecupboard ingredients. Stuffed tomatoes are a great way to use up some of your summer harvest. It’s high summer and the vegetable garden is in full production. 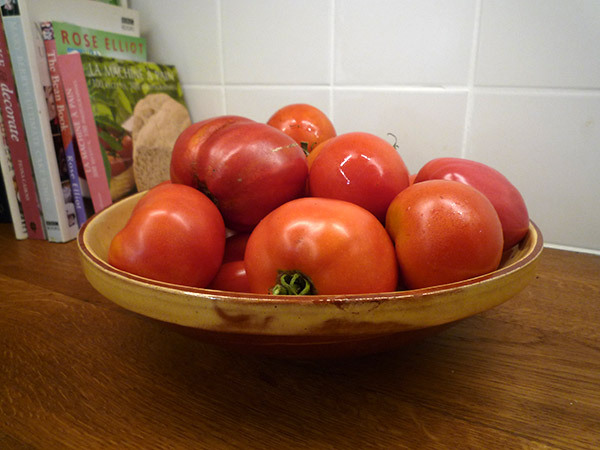 The tomato plants are heavily laden with fruit and with every sunny day that passes the pile of tomatoes in the bowl on the kitchen counter grows ever higher. You’ll be hard pushed to eat them all in salad so see how to use tomatoes in various sauces or serve as a delicious Tomato and Red Lentil soup in my previous posts. For a delicious meal idea, stuffed tomatoes are really satisfying and tasty. They take a little time to prepare but you can make more than you need and they will safely store in the fridge for another time. For this recipe you’ll need some of the large beef tomatoes (coeur de boeuf in France) which are ideal because they have few seeds and make a good sized portion when stuffed. For a good filling you need to create flavours that will pack a punch. You can use fresh herbs or spices, dried fruit and chopped nuts, any rice or grain, or breadcrumbs, then add some protein in the form of meat, tofu or cheese, either feta, mozzarella or a strong cheddar. I combined some brown rice with quinoa to make a Moroccan style filling using cinnamon, dried fruit and cashew nuts with some cheddar cheese. Cous cous would be more appropriate if you have some. Start by cutting off the tops of the tomatoes and scooping out the flesh. Leave the edges quite thick otherwise the tomato will collapse in the oven. 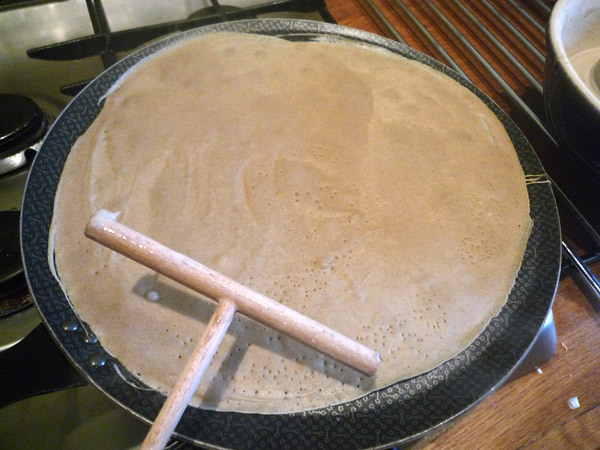 Put the tops to one side and the flesh in a seperate bowl, you’ll use this as part of the filling. To get rid of a lot of the moisture inside the tomatoes, sprinkle with a little salt then turn upside down onto a plate with a piece of kitchen towel on it and leave while you make the filling. 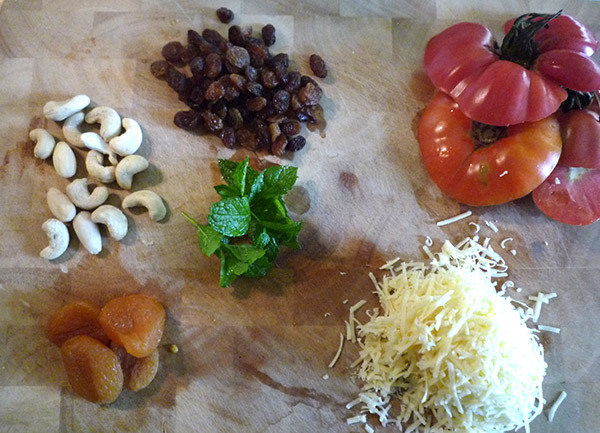 You can add a variety of ingredients to the rice and tomato mixture including fresh herbs, dried fruit, nuts and cheese. Heat the oven to 180°C. Cook the rice or grain according to the instructions. In a little olive oil, fry the onion and garlic. When the onion is soft, add the tomato flesh, simmer, stirring frequently to prevent it sticking, until the mixture has reduced to a pulp. Add the cinnamon then stir in the rice and all the dry ingredients. 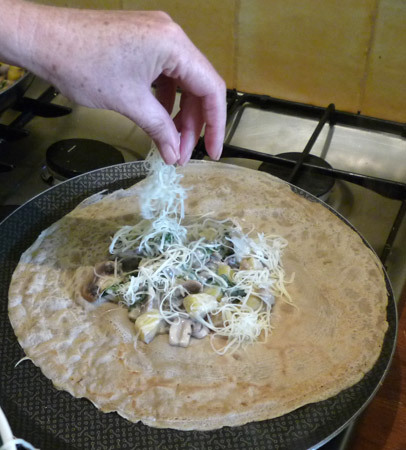 Season with salt and pepper to taste then off the heat, add the cheese and mix thoroughly. Stuffed Tomatoes, an tasty summer meal. Take an ovenproof dish and brush the base with a little olive oil. Place the tomatoes in the dish and spoon in the filling making sure it is pushed in well leaving no space. Any left over filling can be served cold along with a plate of fresh salad and grated vegetables. 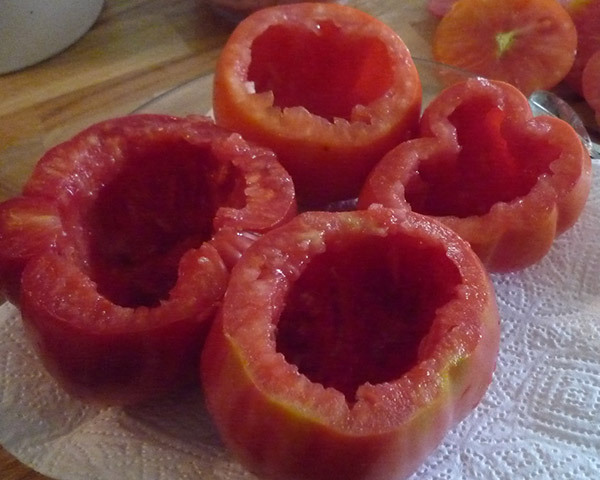 Replace the tomato lids to prevent the filling from drying on the top. 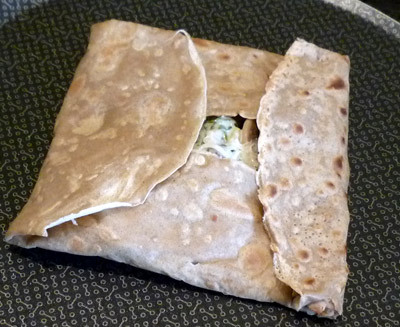 If you prefer, you can cover with some tin foil instead. Place in the oven for about 30 minutes or until the tomatoes are tender and the skins are slightly wrinkled. Serve hot with some green salad. A little mashed potato with olive oil would be lovely. I’ve been experimenting to produce the ultimate home-made veggie burger. If you haven’t got an instant burger mix – I prefer the Granose Meat-free Burger mix, then there are millions of ideas out there to make your own using lentils, kidney beans (in fact almost any kind of bean), chick peas, vegetables and so on. However, they often fall apart while cooking, and most disappointingly in my view, have a soft texture with no “bite” that is probably what I yearn for most without actually eating a meat burger. Quorn products can provide a healthy alternative to meat and as I can get Quorn mince , I set to work to create my perfect veggie-burger. This recipe is infinitely variable and still somewhat experimental but I’ve had some great results so far. It makes approximately 8 burgers. In a frying pan, heat a small amount of vegetable oil and cook the onions and red pepper until they’re soft. Add the Quorn mix and stir for 30 seconds or so to combine. Remove the pan from the heat and transfer the onion and Quorn mixture into a large bowl. Add the seasoning, Tahini, tomato purée, egg and Weetabix crumbs. The chilli gives the burgers a bit of a taste kick and I’ve found they need a bit more than I would normally use to actually create a good flavour but it’s optional if you don’t like it. 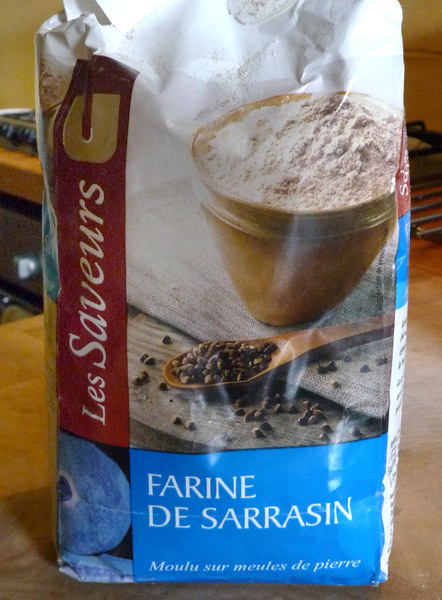 You could try harissa instead of tomato purée, soya sauce or Worcestershire sauce to get some flavour into the burgers. Normal burger recipes use breadcrumbs but I’ve used Weetabix as it has the same binding effect and is readily available in my store cupboard. Using your hand or a wooden spoon, thoroughly mix all the ingredients together so that if you press it, it stays together. 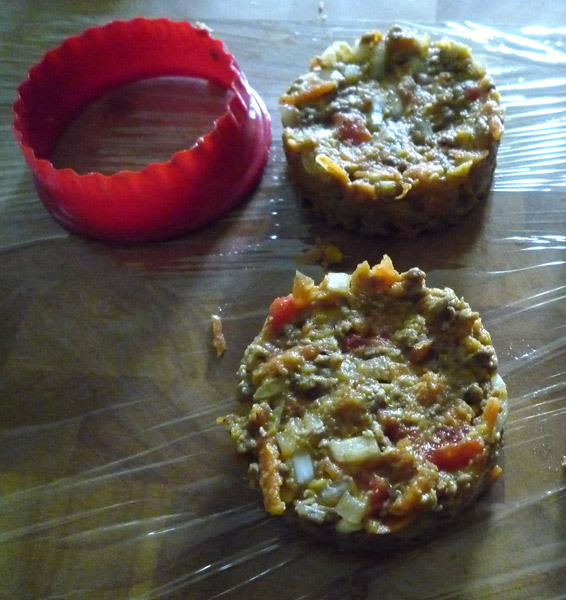 Use a pastry cutter or mould to shape the burgers. I have to say that the onion was not cut finely enough in these first burgers. Lay out a sheet of cling and use a burger mould or an upside-down pastry cutter to shape your burgers. It is best not to cook them straight away but either chill them in the fridge for a couple of hours or if you are short of time, pop them in the freezer until they’re firm. The uncooked burgers freeze well (do not thaw and re-freeze frozen Quorn) and they can be cooked straight from the freezer. They’ll need about 5 minutes each side to heat through and turn a golden brown colour. I usually top them with a slice of burger cheese, place them under the grill for a couple of minutes to melt the cheese then serve in home-made burger buns (see below) with salad, pickles and tomato sauce. 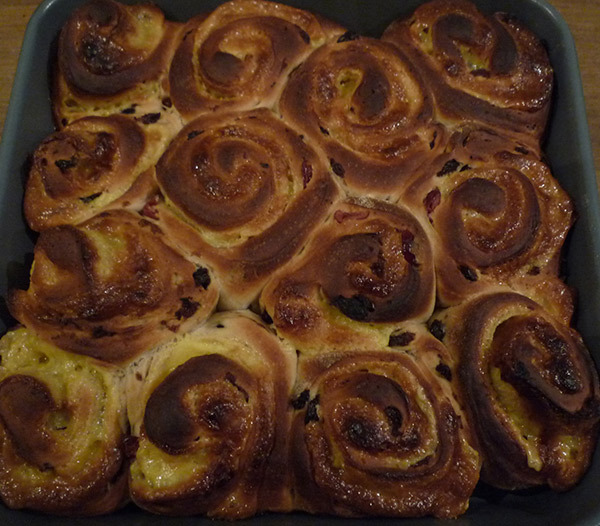 My absolute favourite bun recipe came to me from the Inquiring Chef, an American expat living in Bangkok. She in turn got it from the New York Times and now I’m passing her recipe on to you. 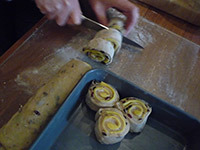 Kneading the brioche bun dough – you’ll need a dough cutter. 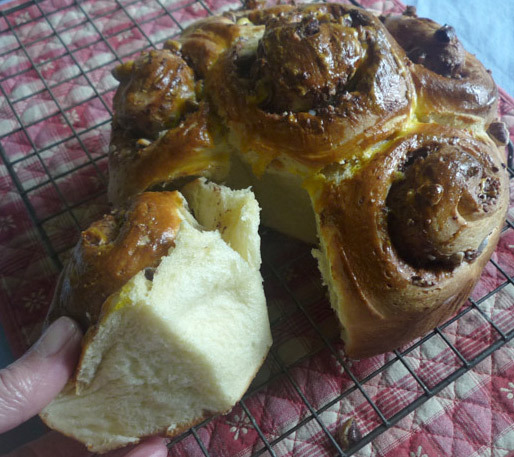 I can honestly say that once tasted, you’ll always be disappointed by every other home-made bun, they are that good. 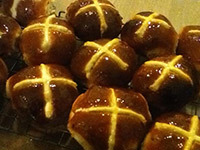 These Light Brioche Buns are quite a challenge the first time you make them as the dough is incredibly sticky but you mustn’t add flour – persevere and reap the rewards. Slice almost through the bun so they are ready to use and store in the freezer until you need them, they don’t take long to thaw or you can defrost them in the microwave in seconds. 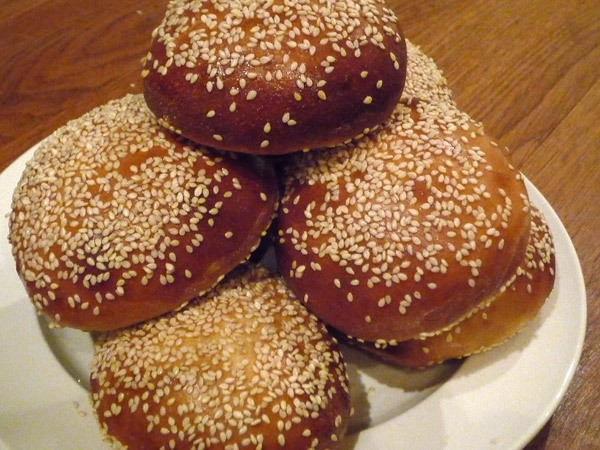 These Light Brioche Buns are perfect for burgers.